Natural science is playing a very important role in the research and protection of the the cultural properties. the Center for Archaeological Operations in Nara National Research Institute studies and develops various methods and thechnologies for archaeological investigations. The Conservation Science Section carries on research in the scientific conservation of artifacts and sites. 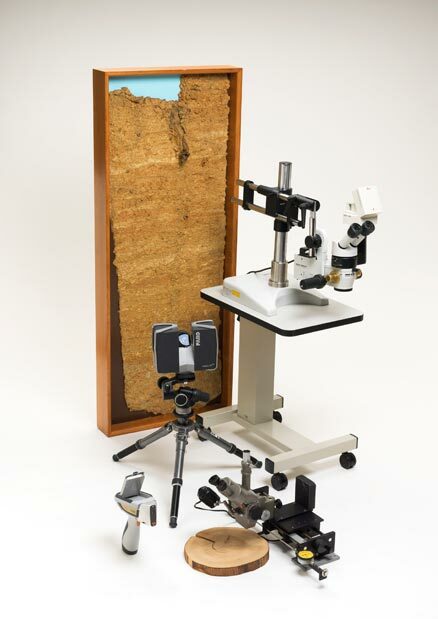 The Environmental Archaeology Section conducts research on the reconstruction of past environments, especially based on the examinations of floral and faunal remains. The Dating Section leads research which applies dendrochronology to the fields of archaeologyand the histories of art and architecture. In this exhibition we would like to show actual functions of these recent technologies used in the excavation of Asuka-Fujiwara capital sites. Ceremorial deposits from the Daigokuden in Fujiwara Palace site. A profile of Takamatuzuka-kofun Mound. Animal bones excavated from the Fujiwara Palace site. Instruments used in various technologies applied to the archaeological investigation.